Updates: this transient has been spectroscopically confirmed as a peculiar type Ia supernova and it is now officially named SN 2014dt, after the CBAT issued the CBET 4011 (login required) Circular, including our observations! After six years since SN 2008in, the beautiful Messier 61 spiral galaxy in Virgo seems to host a new supernova, SN 2014dt. Its temporary designation was PSN J12215757+0428185, and was discovered by the Japanese amateur astronomer K. Itagaki on 29.83 Oct. 2014. At Virtual Telescope, accordingly with our scientific program covering all the possible supernovae, we imaged this transient early on the 31 Oct. morning, while the sky was already brightening because of the rising Sun. The galaxy was also very low on the east, around 15 deg of altitude. Despite this, the supernova was easily captured, as visible in the image above. The picture comes from the average of six, 120-seconds exposures, remotely collected with the PlaneWave 17″+Paramount ME+SBIG STL-6303E robotic unit part of the Virtual Telescope Project. The transient was estimated at mag. 13.0 (R mags for the reference stars from UCAC-4). 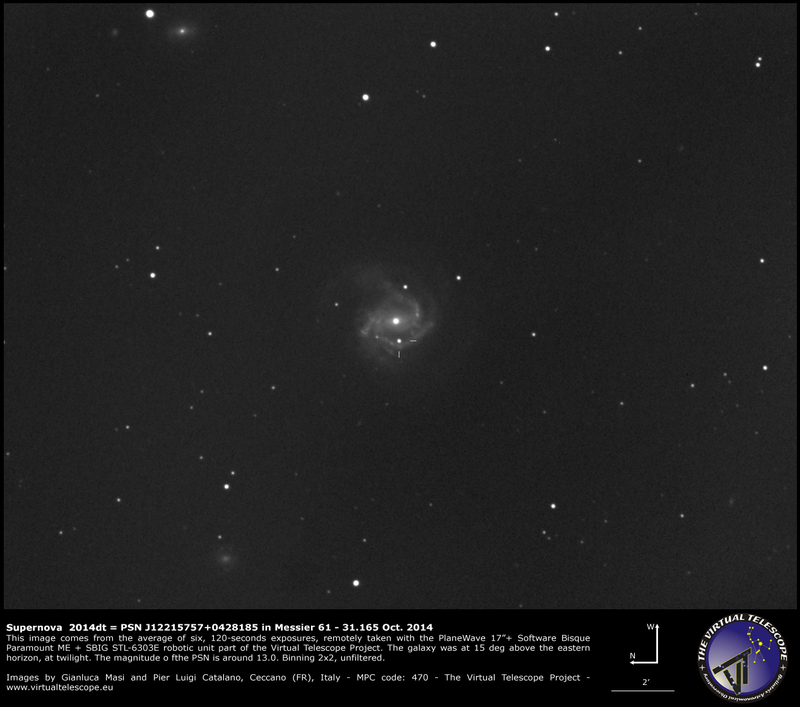 Located at about 52 millions of light years from us, Messier 61 already hosted six supernova event and this one is the 7th one. 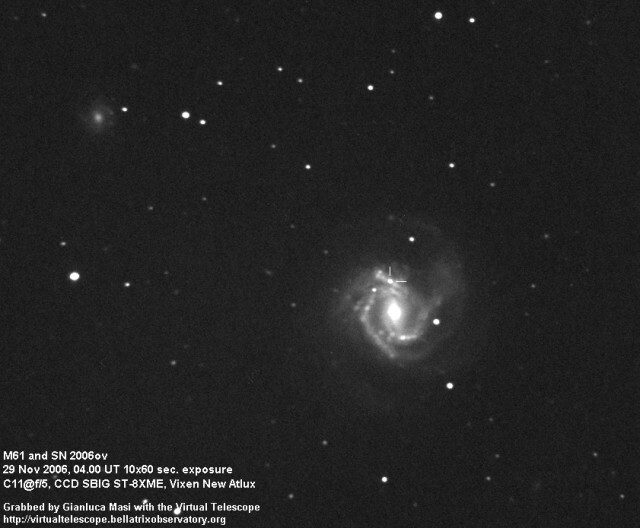 In 2006, at the early days of the Virtual Telescope Project’s life, we imaged its supernova SN 2006ov, as from the image below. We will monitor its evolution on the incoming weeks.